At SCANZ2015 Water*Peace public day and walking symposium my Words for Water work will take two forms. The first will be as part of a looping video being shown at the River Cinema, which will feature Words for Water Stage 2 featured below and an augmented reality work which builds on my past SCANZ2013 work at Puke Ariki – Message to the Mountain. The AR work will be presented at Huatoki Plaza. 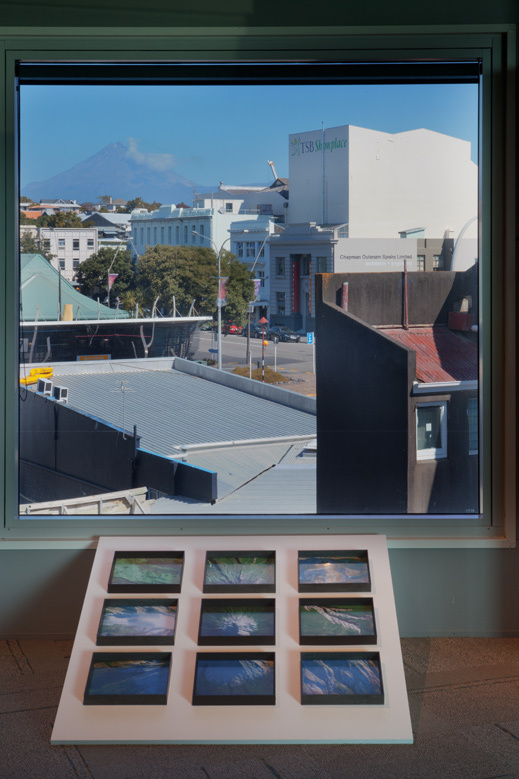 The nine images from Message to the mountain will act as triggers for augmented reality works that expose short videos of some of the waters that run off Mount Taranaki. My work intends to link the mountain to the water, while also linking my experience of Taranaki and SCANZ from past to present. Here are the individual images and you can also access the augmented reality component by following the instructions further down. Words for Water uses augmented reality, and to view it you must have an internet enabled mobile device running iOS or Android (tablet or smartphone). You must also have the “Aurasma” app installed. Open the app, click on the “A” symbol at the bottom of the screen. Now you are ready to view the work. When you are in front of one of the images in the Words for Water installation, click the target icon (bottom centre of the screen) and hold your device in front of the frame to watch it animate. Any time you want to view the work in future, simply launch Aurasma, and it will be ready to go. Note: make sure you are connected to the Internet before holding your device over the images in the Words for Water installation or this blog.